The day has come. I am switching from Comcast to Verizon FiOS. 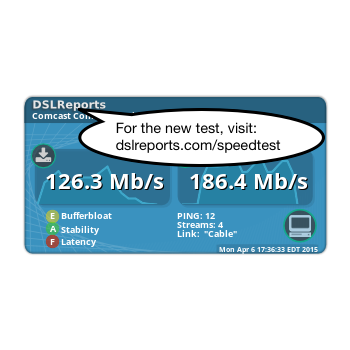 You may be surprised to find I still use Comcast given that I've written so much about Comcast problems. After all, it's been roughly 6 years now that FiOS has been available. So why do I still have Comcast? For many years, Comcast was the only game in town. But after FiOS arrived, Comcast had to improve. Many people in my neighborhood wasted no time in switching. I wondered if Comcast technicians had no one else to serve but me. Bandwidth - all mine! Yes, Comcast's service improved dramatically. Speed was good, latency was good, and customer service was, well, not so bad for a change. While the people on the phones still lived by their dismal scripts, at least the number of times I had to deal with them decreased. I only had to call once in 2011 and so far once in 2012. But I'll never get used to the technicians saying "I fixed the problem. But the guy who was here before me obviously didn't know what he was doing." But through it all, Comcast rates have always been less than Verizon's. Admittedly, it's hard to compare exactly. The speeds don't match up. And while reports suggest that Verizon's service is significantly more reliable, as I mentioned earlier, Comcast has been reliable enough. Which leaves price. And Verizon's price is high. And I'm price sensitive. Indeed, I dropped my Comcast TV service entirely several years ago when I could no longer justify the expense. But recently, I opened my Comcast statement to find out that my price for their Blast internet service went up from $63 to $80. That's a 26% hike. While the percentage is impressive, the old rate was already high. Every so often I checked Verizon's prices but Comcast's $80 was significantly higher than previous quotes I got from Verizon. So I headed over to verizon.com and found it as confusing as I remembered. I finally engaged the e-chat feature and a representative guided me to the rate of $55/month for 12 months for 15/5 with no installation charges. Gee, that sounds pretty good! You may claim Verizon's $55 rate is a promotion but that is rather misleading. I've been on Comcast's promotional rates for years. In my book, any rate that lasts a year or more is not a promotion but the real rate. As an aside, you can be on a Comcast promo and have the price increase. I've had that happen personally. Obviously, promotion can be a very misleading word. - Verizon cannot quote bottom line prices. They refuse to state what "tax and surcharges" will be, only promising that you'll see on your first bill and can cancel the service at that time. Now obviously, this pledge of ignorance is silly. Nor is it new. I've tried to find out this info in the past and ended up being transferred from one department to another and even to supervisors. Even the billing department swore they couldn't tell me. Are they not privy to their own billing system? In fact, this inability to see the true cost was a disincentive for me in the past. If a company has no respect for the potential customer, why would they have any once you've handed over your money? - Verizon only bills through credit cards. (This may have something to do with not having Verizon phone service but if so, it still doesn't make sense.) I hate recurring charges to my credit card! I'm not worried about unauthorized charges (since legally I'm protected). But using a credit card for a recurring charge makes it problematic when I close a credit card, either because the # has been discovered by hackers or I'm just switching to a different card. If they could just send me a bill like every other company, I wouldn't have to go out of my way to contact them just to tell them I changed card numbers. 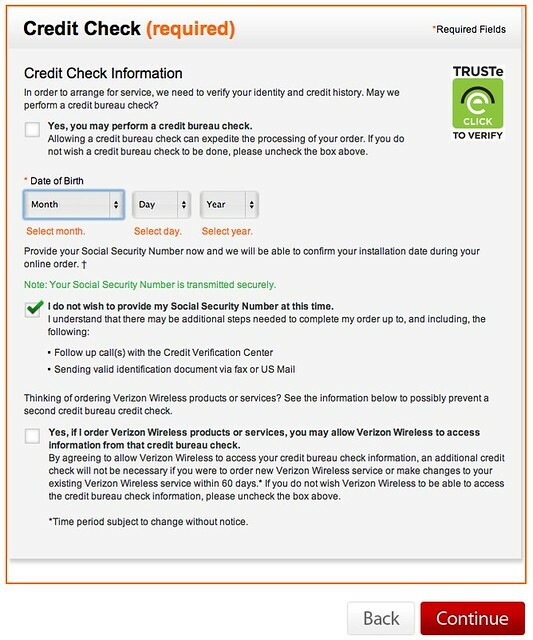 - Verizon's web page has a required credit check section with a confusing collection of form elements that let me decline the credit report, decline to give my SSN, etc. Yet when I declined everything, the page refused to let me continue and wouldn't explain why. Here's a pic showing only that the section has been outlined in orange. That seems to be Verizon's way of saying I wasn't being cooperative. I won't go through everything but I will focus on the Social Security Number (SSN) as a specific problem. Verizon's website claimed that turning over my SSN to them was for my benefit - to confirm it was really me placing the order. But unless Verizon has my SSN already, which I doubt, this makes no sense. The irony is that Verizon, like many companies, pretends to care deeply about the issue of identity theft. One of the many times I was on hold waiting for a Verizon operator to pick up during my hour-and-a-half ordeal, I did some Googling to entertain myself. In doing so, I came across a Verizon web site that advised consumers on various frauds and scams. Identity theft was one of them. This is the way Verizon frames the problem: "People will use a variety of methods to convince you to give up personal information such as Social Security number, credit card numbers, calling card numbers, bank account numbers, etc. Using this information, criminals can pose as you and commit a number of crimes. This will cost you a considerable amount of money and time as you try to restore your credit rating and damaged financial situation." And this is part of how they suggest you protect yourself: "In general, closely guard all of your personal information." Unless, it seems, you are trying to guard it from the phone company. - I finally got to "select a 4-hour installation window" and did so. Then another confirmation button which I dutifully clicked. But only after getting the last (or so I thought) confirmation screen did it finally make clear that the choice of a 4-hour window was totally misleading - it was actually specifying an arrival window and 4 hours would be required for an installation. In other words, I might have to remain home for 8 hours if the tech showed up at the end of the window. An entire business day! Needless to say, I immediately had to reschedule - which I couldn't do from the confirmation screen - it wouldn't let me. I tried to go back to the e-chat - but the chat link that had been plastered at the top of every screen earlier was now gone. Even going to the original verizon.com URL was unproductive because as soon as I clicked on any of the obvious choices - such as Support - it told me I had an order pending again with no chat link. Alternatively, it offered to let me log in but since I had not yet been assigned a login (I was told later that I would receive this info at installation) this went nowhere. After trying many links, I noticed a contact link in the footer that let me re-open a chat and I was able to get help. The new chat rep agreed that I should reschedule my appointment to allow for more time. However, the earliest he could schedule me was for 9 days later. But moments earlier, the website had shown me that the entire week was available. So I asked if he could cancel my order and I would just reorder again through the web. "Don't do that!" he said. He provided another URL for me to try (why couldn't he try it?) and I was able to get another appointment the following day. He was pretty annoyed that I could see appointments an entire week earlier than he could and he said he would report this. - The email had the tax and surcharges that all my other contacts at Verizon claimed they were unable to provide. Why is it that the moment I signed their contract, they were suddenly able to give this info but not before? Alas, there's no breakdown so all I can tell is that my "taxes, fees, and other charges" will be $1.65. That's a bit mystifying because Comcast's "tax, surcharges, and fees" for an $80 bill were only $0.42. Something doesn't add up here but evidently I'll have to wait for a real bill to find out. - The email noted I should remove its return address from my spam blocker. But obviously, it should have said that at the website earlier, not in the very email that would never be seen if I had to take the very action suggested. - The email insisted I click a link to confirm my installation appointment. Huh? Given all the hoops I had jumped through to fill out the forms at verizon's website, surely it was painfully obvious that I had already confirmed I wanted service, no? I began to wonder how many more ways Verizon would come up with to confirm that I was confirming my confirmation. Indeed, when I was later able to sign up for a userid, it asked me to confirm with my zip code. Why yet another confirmation? (And a zip code as confirmation? Huh?) Then it wanted yet more personal info, this time for recovery purposes. (Name of best friend. Name of first pet. Etc.) This is way, way, way past the bounds of common sense. And it's definitely not necessary. (It's one thing for Facebook to need recovery info - they have no proof who I am. But Verizon has my home address! My credit card #! And now my SSN. There is no need to for more. Much less is sufficient. As if to confirm my imagination, I then got not one but three robocalls (including one the following morning that woke me up) on my home phone telling me to call a phone number to confirm my installation. (Another confirmation?!) Even more maddening, the robocalls explained that an install could last not 4 hours as earlier promised but 6 hours. So far, my experience with Verizon has been poor. It has been a never-ending stream of confirmations and "Prove you're you" by requesting more and more personal info and more and more admissions of information. Why Verizon cannot be open about this info (taxes, install windows, etc.) I cannot imagine. Surely, it only costs them more money when customers have to reschedule or cancel service due to finding out things later that should have been taken into account. Yet another communication from Verizon has asked me to prepare for the installation by selecting a place in my house for their equipment. So I embarked on another e-chat with one of their representatives to find out their requirements. Another exercise in frustration. For example, the representative could tell me the width and height of their Optical Network Terminal that would be installed but not its depth. After 30 minutes of similar questions that resulted in confusing answers, she admitted that the technician would figure out how best to do the installation when he arrived. In other words, we had just both wasted 30 minutes. I won't repeat all the unfruitful parts of our conversation but I invite Verizon, which surely has a record of the conversation to find it, study it, and help their representatives do a better job. And I invite Verizon to fix the other problems I've described in this post. If you're trying to figure out why you're not getting more customers, perhaps it's because they can't make it through this unnecessarily difficult and annoying set of interactions. Earlier today, I received a flyer telling me that a contractor (Lambert Cable) would be running the fiber optic cable. (Verizon is still using contractors?) This flyer was handed to me by yet another contractor (UtiliQuest) who showed up to mark the utility lines and suggest a routing for Verizon's fiber optic run. He was wearing a Comcast shirt. In my previous post, I described how the county was looking for input to the Comcast franchise renewal. I explained why you should be interested even if you are not a Comcast subscriber. If this whets your appetite for more, consider serving on Montgomery County's Cable and Comunications Advisory Committee. The CCAC meets once a month to hear and discuss issues of relevance to the franchises, PEGs, the cable office, and other telecommunication related topics. The committee gets an opportunity to meet with the Executive and the Council on occasion to provide advice and insights. It's a volunteer position but if you feel strongly about improving telecommunications in Montgomery County, it may be a good opportunity for you. The county has a web page on the CCAC which provides a bit more information. And I've written about my own service on the CCAC many times - you'll likely find this more revealing as I pull no punches. (I found my time on the CCAC to be valuable but it had its frustrations as well.) Please volunteer - both for the CCAC and to give input on the Comcast franchise renewal. Thanks! [Followup added 3/23/2012] Deadline for applications is 4/6/2012. Here is a link to the county's original vacancy announcement. Comcast's franchise with Montgomery County was signed in 1998 to last a period of 15 years. I've never been through a renewal before but it's my understanding that in some sense, this is an opportunity to start from scratch. Anything in the prior agreement can be changed (except what is required by law). In contrast, during the franchise, things that should be changed often don't get changed but there's little incentive for both sides to agree. We've seen this in the past with wording that turned out to be unclear such as the time it takes to reach a Comcast customer service representative by phone. But that's just the tip of the iceberg. For example, it is unclear how the franchise applies to internet service. Although the franchise does mention internet service, it is with no specificity and current interpretation is that all the promises in the franchise apply only to video service. But that's absurd given that both run over the same cable. If your cable drop is severed, should you get a faster repair date if you're a video subscriber but not if you're internet-only? Each focus group lasts two hours and refreshments will be provided. The focus groups are organized to encourage people with like interests to attend the same meeting to facilitate brainstorming, but anyone may attend any focus group. The same presentation and same questions will be asked at each focus group. You DO NOT have to be a Comcast customer to participate. You may wonder why it says you do not have to be a Comcast customer. There are several reasons for this. First, Comcast uses our rights-of-way so even if you're not a Comcast subscriber, you may be impacted by their use of the ROWs. (Imagine finding your lawn or driveway has been ripped up. Shouldn't you have some protections?) Second, the franchise generates money that is used by the county to fund other things. So you may benefit from these even if you don't pay any cable "taxes". Finally, if you have another provider such as Verizon, it's almost certain that when your provider's franchise is renewed, it will incorporate the same new terms. To get more information on how to participate, go to Montgomery County's cable page. Unfortunately, the county has organized its focus groups around organizations (neighborhood groups, religious groups, government agencies, etc.) so I suspect this will shape the ability to raise certain topics. And I mean that in a bad way. Be prepared to hear a litany of "the county needs this" and "my organization deserves that" but also keep in mind that everything we ask for will ultimately come out of our pockets - just with an extra layer of provider profit grease in there as well. So I encourage you to ask for things to be cut back at the same time. While I'm all for community, some of the expenditures that come out of the franchise are unjustifiable in my opinion. For instance, why do PEG channels require dedicated video channels when they can be streamed less expensively and accessed more conveniently over the web? And even if you find some of these "benefits" justifiable, ask whether it would be cheaper to pay for them explicitly rather than bury the costs behind layers of plans that make them difficult to control. This bundling phenomenon is analogous to the question of who benefits from TV plans of 200 channels when we only watch 10 of them. (Answer: Not you.) What kind of pressure is needed to change this and other problems with our providers? Can we do it in the renewal or is it just a pro forma rubber stamp with a few goodies to fool citizens in to feeling they are getting something for nothing? Lastly, while the county is controlling the participation process, there will be other opportunities. For example, there will be hearings and you can always contact the county council directly. The council itself must ultimately approve the franchise and council members can have a lot of influence in making changes to the franchise. Let me know how you intend to participate (which focus groups) or any other ideas you may have for the renewal process.